Thomas De Gendt (Vacansoleil-DCM) rode himself into a realistic chance of the final podium of the 2012 Giro d’Italia with a virtuoso solo display on the climb to the finish on the Passo dello Stelvio. The 25-year-old Belgian escaped his breakaway companions - Damiano Cunego (Lampre-ISD) and Mikel Nieve (Euskaltel-Euskadi) with 13km of the mythical climb to go, and managed to hold off the chase of the race favourites behind him to take a famous solo victory. Cunego too held off the chasers, taking second, 55 seconds behind, while Nieve was third at 2’50”. “I’m very happy to win on a legendary mountain climb like the Passo dello Stelvio,” said De Gendt. “All the big names in cycling have won here too. I hope it’s a good sign for me. I think I’ve got a future in the Grand Tours. Behind the break, the battle for the pink jersey took on a new dimension. The Belgian began the day in eighth place overall, 5’40” behind Joaquim Rodríguez (Katusha), and with ten kilometres to go he was not only close to the race podium, but threatening the Maglia Rosa. Into the final six kilometres De Gendt had pushed second place Ryder Hesjedal (Garmin-Barracuda) off the second step of the virtual podium, and was just 15 seconds behind Rodríguez. With the other contenders fearing the Canadian’s strength in the following day’s final time trial however, they refused to offer Garmin-Barracuda any help until it was too late. Finally though, a surge from Hesjedal dropped everybody bar Rodríguez and third overall Michele Scarponi (Lampre-ISD). Scarponi escaped with just over two kilometres to go, but was caught by a final kilometre attack from Rodríguez, and Hesjedal almost had him on the line. Rodríguez’ saw him finish 3’22” behind De Gendt, with Scarponi at 3’34” and Hesjedal at 3’36”. The Catalan increased his lead to 31 seconds over Hesjedal, 1’51” over Scarponi, but De Gendt had closed to within 2’18”. With just the flat 30km time trial to come, this might not prove to be enough, with both Hesjedal and, especially De Gendt, far more proficient that either Rodríguez and Scarponi. “I don’t think I’m going to win the Giro d’Italia but I have a good chance to finish third,” De Gendt conceded. “I think Ryder Hesjedal will win the Giro d’Italia. He’s not far behind Rodríguez and he’s the best at time trials." The first half of the stage was characterised by a 14-man break, which included Roman Kreuziger (Astana), Christian Vande Velde (Garmin-Barracuda), Damiano Caruso (Liquigas-Cannondale), Matteo Carrara (Vacansoleil-DCM), Oliver Zaugg (RadioShack-Nissan)and mountains jersey Matteo Rabottini (Farnese Vini-Selle Italia). They stayed together until the steep slopes of the Mortirolo, until Zaugg managed to get away alone. De Gendt had attacked over the top of the climb, and joined up with Carrara on the descent; Cunego too managed to bridge on the way down, while Nieve jumped across on the false flat that followed. The chase group that formed caught up with Zaugg with 30km to go and, as the final climb began, the group had reduced to just the final three. De Gendt dropped the others with 13km to go and, despite the best efforts of Hesjedal’s Garmin-Barracuda teammates Peter Stetina and Christian Vande Velde, managed to extend - then hold - his lead, until the final push from Hesjedal began to close the gap. After a very tough stage the day before, the peloton was in for an even harder one on the road the the 2757 metre high Stelvio. Before the peloton arrived at the mythical climb, it would first have to tackle the fearsome Mortirolo - whose gradients of up to 23% rival the climbs of the Spring Classics - but this was not all, as the first half of the stage was peppered with numerous lesser obstacles. The climb to the 2nd category Passo del Tonale, which topped out after 32.9km, would begin almost immediately, and would be followed by the 3rd category ascents to Aprica and Teglio, after 78.3km and 98.1km respectively. If these were not enough to soften up the legs of the peloton, the 50km between Teglio and the foot of the Mortirolo would have virtually no flat roads at all. This was to be the final chance for the climbers in the race to put pressure on - and, they hoped, time into - the time triallists before the final Milan stage against the clock. Specifically, Rodríguez surely needed to extend his 17 second lead over Hesjedal, if he was to have much of a chance to hold onto the Maglia Rosa the next day. The breakway group escaped after just 22km, as the climb to the Passo del Tonale began in ernest. Between them, the 14 riders managed to open up a lead of almost six minutes over the earlier climbs as Rabottini picked up as many points as he could to secure his blue jersey. The gap was less than three minutes, as the lower slopes of the Mortirolo began however. The group began to split immediately on the steep slopes of the climb and, with nine kilometres still to climb though, Zaugg attacked the group; he was joined by Carrara and they set off together towards the top. A few of the others managed to make their way across but, with six kilometres to climb, Zaugg attacked again and was alone over the top. A brief attack from Rodríguez behind, which was immediately followed by Hesjedal, saw the main group reduced to just 20 riders as it approached the summit. De Gendt took the lead, and then attacked in the final steep section, and caught up with teammate Carrara, who buried himself for a few minutes. The Belgian then left him behind, and was almost 30 seconds clear of the Maglia Rosa group as he hit the top, and began the equally steep, and winding descent. Carrara managed to escape the group on the descent and made his way across to De Gendt, and was followed by Cunego. As Zaugg hit the bottom he was 1’40” ahead of the first chase group, but Carrara, De Gendt and Cunego were gaining on them. The Maglia Rosa group was 3’20” back, and was sitting up a little and allowing others to join from behind. Nieve attacked however, on the gentle gradient, and they let him go, as teammate Jon Izaggire pulled him up to the De Gendt/Cunego group. Johann Tscopp (BMC Racing) tried to do the same with teammate Mathias Frank - who’d been in the break - as did Omega Pharma-Quick Step’s Dario Cataldo with Serge Pauwels, but their attack was not to last for too long. Izagirre managed to pull Nieve and Tanel Kangert (Astana) up to the chase group and, with 35km to go, they were just 2’04” behind Zaugg. The Swiss rider was tiring however, and was caught just before the 30km to go banner. Stetina was among those able to join the Maglia Rosa group, and the young American was now leading the chase - along with Vande Velde, who had dropped back - on behalf of Hesjedal. As the final climb began, the front group was made up of just Euskaltel-Euskadi pair Nieve and Izagirre, De Gendt, Cunego, Kangert, Zaugg, and Andrey Amador (Movistar). They were exactly four minutes ahead of the peloton, which meant that De Gendt was threatening third place Scarponi. Izagirre had done his job and pulled off the front, and as De Gendt took over. Zaugg was dropped. Behind them, Stetina also pulled over, leaving the pacing of the peloton to Vande Velde and, with 20km to go, the gap was down to 3’42”. With 17.5km to go Kangert was forced to watch the others ride away and, shortly afterwards, De Gendt attacked. Nieve was straight up to him, with Cunego trying to follow, but this was the end for Amador. With 15km to go Cunego was still dangling 13 seconds behind the two leaders, while the shrinking, Vande Velde-led peloton was still 3’44” back. 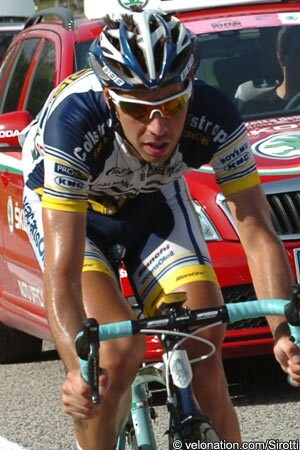 The 2004 Giro winner was gradually clawing his way across however, making contact with 13km to go, but De Gendt responded by attacking again; this time neither was able to respond. With ten kilometres to go, the Belgian was 52 seconds ahead of Cunego and Nieve, and - since he was effectively just riding against Vande Velde - the peloton was now almost five minutes behind him. Hesjedal and Rodríguez were still ahead, for now, but he had pushed Scarponi off the virtual podium. Hesjedal began to look to the others for help though, as he could see the Vacansoleil-DCM rider walking away with the race. Caruso came around him, to take up station behind Vande Velde, but as they passed under the ten kilometre banner, the clock said 5’05”; De Gendt was now just 35 seconds away from the Maglia Rosa! At the 8km point Gadret attacked, but Henao pulled the peloton up to him; this was the end for Vande Velde, as the Colombian Sky rider took up station at the front. The group had shrunk further but, as De Gendt entered the final six kilometres, the GPS clock said that he was two seconds ahead of Hesjedal, and only 15 behind Rodríguez. The Belgian was tiring however, and the fresher Sky rider behind him was gradually closing the gap. Gadret attacked again and, with De Gendt more of a worry, he was allowed to go. Finally though, Hesjedal himself took over the chase, but he was still looking over his shoulder for help from the rest. Gradually the Canadian pulled back Gadret, but under the five kilometre banner he was still 5’16” behind; the Belgian was no longer ahead of Hesjedal in the virtual standings, but was still just 24 seconds away from the race lead. The rest of the favourites for the race were lined up behind the Garmin-Barracuda rider, but none would - or could - respond to his twitching elbow and come past. Hesjedal accelerated again and dropped everyone but Rodríguez and Scarponi. Finally the gap was coming down, but then Scarponi attacked as they approached the final two kilometres. Just as De Gendt was winning the stage, Rodríguez, who had barely moved from Hesjedal’s wheel since the Mortirolo, finally attacked and the Canadian could not respond. As he caught Scarponi and crossed the line, he had done enough to hold off De Gendt, and take another 14 seconds from Hesjedal. With a 30km time trial to come however, this might not have been enough. Heartbreakingly for World champion Mark Cavendish (Team Sky), Rodríguez’ fourth place meant that the Catalan took away his red points jersey. ITA 10 Ivan Basso (Liquigas - Cannondale) s.t. CRC 19 Andrey Amador Bakkazakova (Movistar Team) s.t. ITA 24 Damiano Caruso (Liquigas - Cannondale) s.t. ESP 33 Sergio Pardilla Bellon (Movistar Team) s.t. ESP 37 Jon Izagirre Insausti (Euskaltel - Euskadi) s.t. FRA 42 Guillaume Bonnafond (Ag2R - La Mondiale) s.t. ESP 49 Alberto Losada Alguacil (Katusha Team) s.t. ITA 50 Matteo Bono (Lampre - ISD) s.t. BEL 52 Bart De Clercq (Lotto - Belisol Team) s.t. ITA 55 Alessandro Ballan (BMC Racing Team) s.t. ITA 57 Mauro Santambrogio (BMC Racing Team) s.t. NED 58 Brian Bulgac (Lotto - Belisol Team) s.t. ITA 59 Fabio Sabatini (Liquigas - Cannondale) s.t. AUT 60 Stefan Denifl (Vacansoleil - DCM Pro Cycling Team) s.t. ITA 61 Simone Ponzi (Astana Pro Team) s.t. ITA 62 Matteo Rabottini (Farnese Vini - Selle Italia) s.t. ESP 63 Juan Manuel Garate (Rabobank Cycling Team) s.t. NED 64 Stef Clement (Rabobank Cycling Team) s.t. KAZ 65 Andrey Zeits (Astana Pro Team) s.t. UZB 66 Sergey Lagutin (Vacansoleil - DCM Pro Cycling Team) s.t. VEN 67 Jackson Rodriguez (Androni Giocattoli - Venezuela) s.t. GER 68 Grischa Niermann (Rabobank Cycling Team) s.t. FRA 69 Sandy Casar (Equipe Cycliste FDJ - BigMat) s.t. SWE 70 Gustav Erik Larsson (Vacansoleil - DCM Pro Cycling Team) s.t. BLR 71 Branislau Samoilau (Movistar Team) s.t. NED 72 Martijn Keizer (Vacansoleil - DCM Pro Cycling Team) s.t. POL 74 Przemyslaw Niemiec (Lampre - ISD) s.t. ITA 75 Marco Pinotti (BMC Racing Team) s.t. ITA 76 Ivan Santaromita (BMC Racing Team) s.t. LAT 77 Gatis Smukulis (Katusha Team) s.t. ESP 78 Jose Herrada Lopez (Movistar Team) s.t. ESP 79 Victor Cabedo Carda (Euskaltel - Euskadi) s.t. DEN 81 Alex Rasmussen (Garmin - Barracuda) s.t. BLR 84 Aleksandr Kuschynski (Katusha Team) s.t. KAZ 87 Alexandr Dyachenko (Astana Pro Team) s.t. ITA 90 Luca Mazzanti (Farnese Vini - Selle Italia) s.t. LTU 91 Ramunas Navardauskas (Garmin - Barracuda) s.t. BEL 92 Jens Keukeleire (Orica - GreenEDGE) s.t. NOR 93 Gabriel Rasch (Equipe Cycliste FDJ - BigMat) s.t. UKR 94 Volodymyr Gustov (Team Saxo Bank) s.t. DEN 95 Lars Ytting Bak (Lotto - Belisol Team) s.t. ITA 96 Oscar Gatto (Farnese Vini - Selle Italia) s.t. ITA 97 Daniele Pietropolli (Lampre - ISD) s.t. ITA 98 Emanuele Sella (Androni Giocattoli - Venezuela) s.t. ITA 99 Sacha Modolo (Colnago CSF Bardiani) s.t. NZL 100 Jesse Sergent (RadioShack - Nissan) s.t. BEL 101 Dennis Vanendert (Lotto - Belisol Team) s.t. BEL 102 Julien Vermote (Omega Pharma - Quickstep) s.t. ITA 103 Angelo Pagani (Colnago CSF Bardiani) s.t. ITA 104 Matteo Montaguti (Ag2R - La Mondiale) s.t. ITA 105 Paolo Longho Borghini (Liquigas - Cannondale) s.t. ESP 106 Juan José Oroz Ugalde (Euskaltel - Euskadi) s.t. POR 107 Nelson Oliveira (RadioShack - Nissan) s.t. GBR 108 Geraint Thomas (Sky Procycling) s.t. ITA 109 Eros Capecchi (Liquigas - Cannondale) s.t. POL 110 Bartosz Huzarski (Team NetApp) s.t. GBR 111 Ian Stannard (Sky Procycling) s.t. BEL 112 Nikolas Maes (Omega Pharma - Quickstep) s.t. CAN 114 Christian Meier (Orica - GreenEDGE) s.t. ITA 115 Pier Paolo De Negri (Farnese Vini - Selle Italia) s.t. ITA 116 Adriano Malori (Lampre - ISD) s.t. RUS 117 Pavel Brutt (Katusha Team) s.t. ITA 118 Valerio Agnoli (Liquigas - Cannondale) s.t. ESP 119 Benat Intxausti (Movistar Team) s.t. ESP 120 Adrian Saez De Arregi (Euskaltel - Euskadi) s.t. FIN 121 Jussi Veikkanen (Equipe Cycliste FDJ - BigMat) s.t. POL 122 Michal Golas (Omega Pharma - Quickstep) s.t. AUT 123 Bernhard Eisel (Sky Procycling) s.t. BEL 124 Sebastien Rosseler (Garmin - Barracuda) s.t. POL 125 Michal Kwiatkowski (Omega Pharma - Quickstep) s.t. ITA 126 Stefano Pirazzi (Colnago CSF Bardiani) s.t. FRA 127 Julien Berard (Ag2R - La Mondiale) s.t. FRA 128 Francis Mourey (Equipe Cycliste FDJ - BigMat) s.t. GBR 129 Mark Cavendish (Sky Procycling) s.t. FRA 130 Mickaël Delage (Equipe Cycliste FDJ - BigMat) s.t. DEN 131 Anders Lund (Team Saxo Bank) s.t. POL 132 Maciej Bodnar (Liquigas - Cannondale) s.t. RUS 133 Mikhail Ignatyev (Katusha Team) s.t. ARG 134 Lucas Sebastian Haedo (Team Saxo Bank) s.t. ITA 135 Cesare Benedetti (Team NetApp) s.t. ESP 136 Miguel Minguez (Euskaltel - Euskadi) s.t. GER 137 Andreas Schillinger (Team NetApp) s.t. ESP 138 Ángel Vicioso Arcos (Katusha Team) s.t. AUT 139 Daniel Schorn (Team NetApp) s.t. FRA 140 Pierre Cazaux (Euskaltel - Euskadi) s.t. AUT 141 Matthias Brandle (Team NetApp) s.t. USA 142 Taylor Phinney (BMC Racing Team) s.t. ITA 143 Manuele Boaro (Team Saxo Bank) s.t. ITA 144 Enrico Battaglin (Colnago CSF Bardiani) s.t. CAN 145 Svein Tuft (Orica - GreenEDGE) s.t. ITA 146 Roberto Ferrari (Androni Giocattoli - Venezuela) s.t. ITA 147 Alessandro De Marchi (Androni Giocattoli - Venezuela) s.t. AUS 148 Luke Roberts (Team Saxo Bank) s.t. ITA 151 Marco Coledan (Colnago CSF Bardiani) s.t. DEN 154 Jonas Aaen Jorgensen (Team Saxo Bank) s.t.